Background: Diabetic retinopathy (DR) is the most common complications of diabetes mellitus (DM) which needs early detection. Delay in referral of patients with significant DR by physicians to the concerned ophthalmologist may compromise visual outcome since early treatment is associated with a 50% reduction in the risk of visual loss. Objective: The aim of this study is to assess the relationship between delays in diabetic patient's referral for DR screening after diagnosis of DM and the level of the DR detected at Sudan. Materials and Methods: A 2-year prospective cross-sectional study was conducted on 240 patients with type I and II, newly referred patients in the period from January 2013 to February 2015. The estimated time lapse between this first DR screening and the onset of DM was recorded as “delay period” in diabetic patient's referral for DR screening, which was compared with the level of DR and the level of visual loss at the time of the first visits. Results: In a 2-year study (2013–2015), 240 were newly referred diabetic patients, 225 type 2 DM (93.75%), and 15 (6.25%) type I DM. DM duration was 17.6 years (2–40 years); 202 with poor control. Eighty-nine were hypertensive with a mean duration of 3.7 years. About 83.3% were referred by general ophthalmologists, 10.4% by physicians, 4.2% by optometrists, and 2.1% by their own will. Nearly 85% referred for their visual disturbances and 15% for self-referral. Two hundred and eleven patients (87.09%) had one form of DR; while only 29 patients did not apparent DR. Low-risk DR recorded in 174 (72.5%), high risk in 66 (27.5), and diabetic macular edema (DME) in 94 (39.2%). The average delay was 14.8 years; 15.5 years for men and 14.04 years for women. The average percentage of visual loss in the low-risk group was 16.7% (visual score of 83.3%). While the visual loss in the high risk was 69.3% (visual score of 30.7%). DME reported 36.6% visual loss and 63.4% visual score. The mean visual loss in all diabetic study population was 40.9% with the total visual score of 59% which equivalent to 6/40 at the moderate low vision range of the World Health Organization. Conclusion: There was a strong correlation between the levels of DR detected and the percentage of visual loss. The “no apparent DR group” recorded the minimal detection of visual loss. Diabetic retinopathy (DR) is a progressive  major cause of new-onset blinding visual morbidity with diabetes mellitus (DM) in working age population, which is thought to be 90% overcome by the current modern management strategies for DR. It is largely asymptomatic until its latest stages, emphasizing the importance of early referral by primary care providers for regular screening examinations. Early detection and monitoring its progression through screening programs and appropriate referral for therapy are important to preserve vision in diabetics., There is a considerable geographical variability in rates of ophthalmic care in developing countries, Sudan not an exceptional; hence, utilization of all available eye care services: public, private, health insurance, and rural and urban residence is significant factors associated with eye health-care service use. Therefore, the expected referral sources for DR screening are all health workers such as general practitioners, community health nurses, diabetes educators, ophthalmologists, optometrists, opticians, and allied health professionals involved in vision care and diabetes management. A 2-year cross-sectional study was conducted on 240 (n = 480 eyes) consecutive adult Sudanese diabetic patients, type I and type II, diabetic patients who were newly referred to our “every Saturday Diabetic Retina Clinic (DRC)” at Sudan Eye Center, in the period from January 5, 2013 to February 7, 2015. Patients were included once in this study. Detailed standardized ophthalmic medical history and demographic data of all participants were considered and reported in the predesigned “data collection forms” at the time of examination which were taken by the researcher from each patient. Careful inquiries were recorded the date of onset and diagnosis of DM by patient's physician and the date of first self or referral (written or verbal) visit to an ophthalmologist for checking and screening the patient's DR status. The estimated time lapse between this first DR screening and the onset of DM was recorded. This taken as the “delay period” in diabetic patient's referral for DR screening, which was compared with the level of DR detected and the level of visual loss at the time of the first visits to ophthalmologist or to DRC. All patient underwent a detailed eye examination according to the protocol of the DRC diabetic patients' examination and managements. Best-corrected visual acuity was assessed by the projected Snellen's through a wall mounted Chart Projector (CP; CP-770; NIDEK CO., LTD. 34-14 Maehama, Hiroishi-cho, Gamagori, Aichi 443-0038, Japan; www.nidek.com). Levels of vision score and vision loss percentages were recorded at the first visits. Originally, recorded in standard Snellen format then converted to logMAR format by “Mahgoub Saleem visual acuity table, conversion, score and range” for easily statistical calculation purposes to assess the level of visual loss. Intraocular pressure was done routinely by Goldmann Applanation Tonometer (Haag-Streit diagnostics-applanation tonometer AT 900®/870 18. Edition/2014-11; HAAG-STREIT AG Gartenstadtstrasse 10 3098 Koeniz, Switzerland www.haag-streit.com). Pupillary reflexes, extraocular muscles assessments, and proper adnexa examination were done. Systematic slit lamp (Haag-Streit diagnostics slit lamp BQ 900/870 18./2014-11; HAAG-STREIT AG Gartenstadtstrasse 10 3098 Koeniz, Switzerland, www.haag-streit.com) biomicroscopic examination for anterior segment was done for all patients. Then coupled by biomicroscopic extended fundoscopy using + 90 and + 78 diopter lenses (V90C, V78C; Volk Optical Inc.,7893, OH 44060, USA www: volk@volk.com) and indirect ophthalmoscopy with binocular indirect ophthalmoscope + 20 diopter lens (all Pupil-Keeler BIO; 1204-P-3043; manufactured in the UK by: Keeler Limited Clewer Hill Road Windsor Berkshire SL4 4AA England; www.keelerusa.com/+20 Diopters-Volk Optical lens Inc.) for posterior segment examination to assess the presence, types, and severity of DR. Fluorescein fundal angiography, optical coherence tomography (OCT), and B-scan ultrasonography were done for selected cases. (VISUCAM ®PRONM Fundal camera and ZEISS CIRRUS HD-OCT;manufactured by Carl Zeiss Meditec AG; Göschwitzer Straße 51-52; 07745 Jena, Germany; B-scan ultrasound biometer, AL-100, manufactured by Tomey Corporation; 2-11-33 Noritakeshinmachi, Nishi-Ku, Nagoya, Aichi-ken, 451-0051, Japan). In total, 240 (n = 240) newly consecutive adult referred diabetic patients were examined during the study period from January 5, 2013 to February 7, 2015. 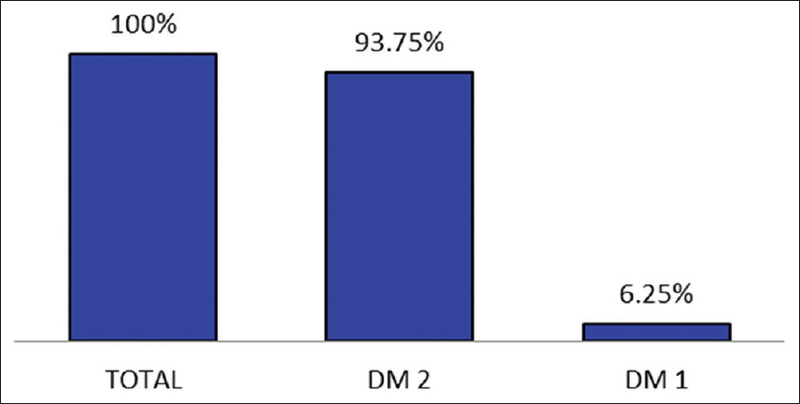 Out of the total study group, 225 patients (93.75%) were type II DM (117; 48.75% men and 108; 45% women) and very few: only 15 patients (6.25%) were type I DM (8 men and 7 women) [Figure 1]. The mean age of the study population was 60.34 years (range, 13–88 years); 60.8 years for men and 59.9 years for women. 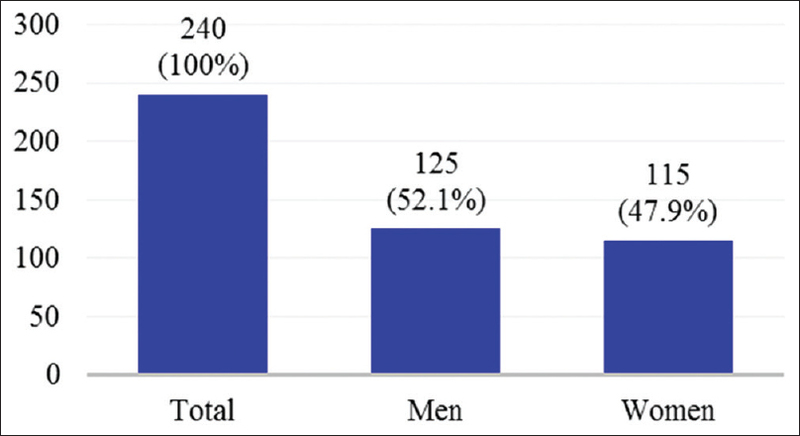 There was slight male predominance (4.2%) with 125 Sudanese men (52.1%) and 115 Sudanese women (47.9%) [Figure 2]. The mean duration of known DM before referral was 17.6 years (2–40 years); male patients being 18.2-year DM duration (2–40 years), and females' being 2 years less, 16.8-year DM duration (2–36 years). The majority of diabetic patients had poor control (n = 202; 88.33%), whereas only 11.67% (n = 38) had good control. Concomitant systemic hypertension (HTN) was reported in 89 patients (36.08%: n = 41; 17.06% males and n = 48; 20.0% females). The average duration of HTN was 3.7 years (4.39 years in females and 3.01 in males). 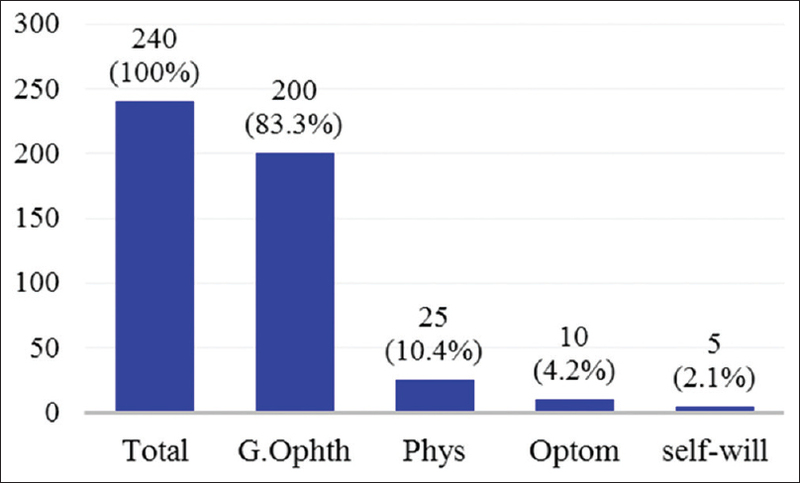 Two hundred patients (n = 200; 83.3%) were referred (written or verbal) by the general ophthalmology outpatient clinics, 25 (10.4%) patients were referred by physicians, 10 (4.2%) by optometrists, and 5 (2.1%) by self-will (to check the effect of DM on their back of the eye and DR status) [Figure 3]. 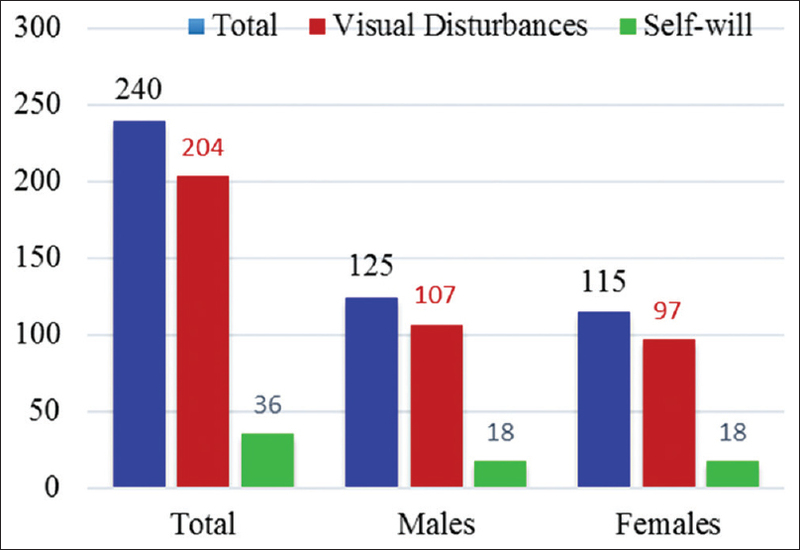 The main reason for referral was visual disturbances; 85% (n = 204; 107 males and 97 females); while only 15% (n = 36; 18 men and 18 women) came to check the effect of DM on their back of the eye and DR status (self-will referral) [Figure 4]. Two hundred and eleven patients (n = 211; 87.9%) had one form of DR, whereas only 29 (12.1%) patients (males were 13; 5.42% and females were 16; 6.7%) did not have any apparent DR (no apparent DR seen). 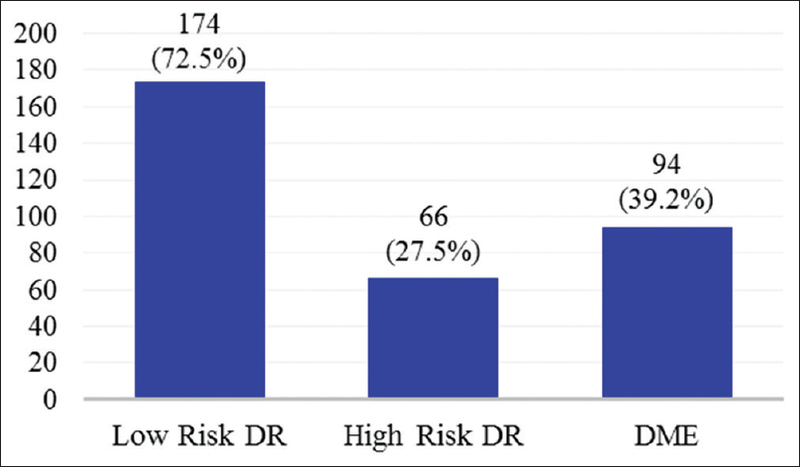 In the DR group, the low-risk DR category significantly constituting the majority of DR cases which recorded in 174 (72.5%) patients, whereas those in high-risk DR category were 66 patients (27.5 distributed between the whole spectra of DR found [Figure 5]. Overall, estimated average time lapse (delay) “between the onset of DM and the time of the first DR screening in this study group” in both sexes was 14.8 years (range, from newly diagnosed to 36 years). There was slight more delay time regarding the males than the females; 15.5 years for men (1–36 years) and 14.04 years (0–33 years) for women. The percentage of visual loss in the low-risk group was found to be 16.7% and their visual score percentage was 83.3%. While the percentage of visual loss in the high risk was found to be 69.3% and their percentage of visual score was only 30.7%. The percentage of visual loss in the DME group was found to be 36.6% and their visual score percentage was 63.4% [Table 1]. The average percentage of total visual loss in the diabetic study population was 40.9% with the total visual score of 59% which equivalent to 6/40 (20/130) in the standard Snellen format in the “range of moderate low vision of the World Health Organization and the International College of Ophthalmologists”. DR as the most common chronic complication of diabetes, it is the fifth common cause of preventable blindness it is the leading cause of visual disability in adult's diabetics., The important risk factors for progression to vision loss include duration of diabetes, poor hyperglycemic control, HTN, and possible dyslipidemia but with inconsistent evidence. Association between the longer duration of DM as DR's important risk factor and increased prevalence of DR is reported in many studies. Reduction of diabetic's population DR risk can be by maintained through regular scheduled community and clinical screening programs, beside awareness of the diabetic care provider for the needs of early referral to the concerned ophthalmologist. In the current study, the cumulative incidence of DR reached 87.9% at 14.8-year DM duration, which can be supported by many other international studies where the cumulative incidence of DR increases with time. As in the UK, the cumulative incidence of DR at 4 years was 26.0% increased to  39.6% at 6 years (Younis et al., 2003) and to 66% at 10 years. While in the US, it reached 72.3% at 14 years. In some other population-based and community studies, the DR prevalence was very variable and did not comment on duration or delay time to diagnosis of DR:,, Williams et al., in The European Diabetes Study, reported that the prevalence of DR in the 10,709 studied diabetes patients in UK population-based study was 16.5%, having PDR being 10.8%., While in the same report, they mentioned the prevalence of DR following a population-based study in Sweden scored 27% prevalence rate. Furthermore, in other two large Indian studies reported by Williams et al. on behalf of Rema et al., the DR prevalence was 34.1%, with 3.4% having PDR and 6.4% DME. Another Libyan population-based study found that the prevalence of DR was 30.5% in type II diabetic patients. An explanation of this big discrepancies could be due to the deferent study designs, as the current study was cross-sectional hospital based in patient already referred due to their DM complications, while the others were population-based studies of big numbers of studied diabetics. This current study demonstrated that the rate of detection of referable DR is higher in those who were not screened promptly after diagnosis of DM. A condition which was agreed with Scanlon et al., in the data extracted from the English National Health Service diabetic eye screening program (2005, 2006, or 2007).,,, They reported that any delaying screening time is worsening DR up to 20.3% within 3-year delay,,,, to some extend, regardless to the presence of concomitant systemic HTN which was reported in 89 patients with an average of 3.7-year duration. Furthermore, regardless to the blood glycemic control, in spite of the majority of the study group being with poor control (n = 202; 88.33%) and only a few with good control (n = 38; 11.67%). There was a strong correlation between the levels of vision-threatening DR detected and the worsening of DR “regardless to the concomitant systemic hypertension and blood glycemic control,” or eventually the percentage of visual loss. The “no apparent DR group” recorded the minimal detection of visual loss. Fante RJ, Durairaj VD, Oliver SC. Diabetic retinopathy: An update on treatment. Am J Med 2010;123:213-6. Frank RN. Diabetic retinopathy. N Engl J Med 2004;350:48-58. American Academy of Ophthalmology Retina Panel. Preferred Practice Pattern® Guidelines. Diabetic Retinopathy. San Francisco, CA: American Academy of Ophthalmology; 2008. Available from: http://www.one.aao.org/CE/Practice Guidelines/PPP.aspx. [Last accessed on 2009 Aug 27]. Chakrabarti R, Harper AC, Keeffe JE. Diabetic retinopathy management guideline. Expert Rev Ophthalmol 2012;74:17-439. Keeffe JE, Weih LM, McCarty CA, Taylor HR. Utilisation of eye care services by urban and rural Australians. Br J Ophthalmol 2002;86:24-7. Keeffe J. Screening for Diabetic Retinopathy: A Planning and Resource Guide. Centre for Eye Research Australia; 2003. Saleem M. Mahgoub saleem visual acuity conversion, score, and range table. Basar Int J Ophthalmol 2015;3:25. Wu L, Fernandez-Loaiza P, Sauma J, Hernandez-Bogantes E, Masis M. Classification of diabetic retinopathy and diabetic macular edema. World J Diabetes 2013;4:290-4. Lindblad AS. Observational study of the development of diabetic macular edema following pan retinal (Scatter) photocoagulation given in 1 or 4 sittings. Arch Ophthalmol 2009;127:132-40. Wilkinson CP, Ferris FL rd, Klein RE, Lee PP, Agardh CD, Davis M, et al. Proposed international clinical diabetic retinopathy and diabetic macular edema disease severity scales. Ophthalmology 2003;110:1677-82. Lee R, Wong TY, Sabanayagam C. Epidemiology of diabetic retinopathy, diabetic macular edema and related vision loss. Eye Vis (Lond) 2015;2:17. Cheung N, Mitchell P, Wong TY. Diabetic retinopathy. Lancet 2010;376:124-36. Bourne RR, Stevens GA, White RA, Smith JL, Flaxman SR, Price H, et al. Causes of vision loss worldwide, 1990-2010: A systematic analysis. Lancet Glob Health 2013;1:e339-49. Thomas RL, Dunstan F, Luzio SD, Roy Chowdury S, Hale SL, North RV, et al. Incidence of diabetic retinopathy in people with type 2 diabetes mellitus attending the Diabetic Retinopathy Screening Service for Wales: Retrospective analysis. BMJ 2012;344:e874. Younis N, Broadbent DM, Vora JP, Harding SP; Liverpool Diabetic Eye Study. Incidence of sight-threatening retinopathy in patients with type 2 diabetes in the Liverpool Diabetic Eye Study: A cohort study. Lancet 2003;361:195-200. Stratton IM, Kohner EM, Aldington SJ, Turner RC, Holman RR, Manley SE, et al. UKPDS 50: Risk factors for incidence and progression of retinopathy in Type II diabetes over 6 years from diagnosis. Diabetologia 2001;44:156-63. Lee ET, Lee VS, Kingsley RM, Lu M, Russell D, Asal NR, et al. Diabetic retinopathy in Oklahoma Indians with NIDDM. Incidence and risk factors. Diabetes Care 1992;15:1620-7. Morgan CL, Currie CJ, Stott NC, Smithers M, Butler CC, Peters JR. The prevalence of multiple diabetes-related complications. Diabet Med 2000;17:146-51. Williams R, Airey M, Baxter H, Forrester J, Kennedy-Martin T, Girach A. Epidemiology of diabetic retinopathy and macular oedema: A systematic review. Eye (Lond) 2004;18:963-83. Rema M, Ponnaiya M, Mohan V. Prevalence of retinopathy in non insulin dependent diabetes mellitus at a diabetes centre in Southern India. Diabetes Res Clin Pract 1996;34:29-36. Scanlon PH. The English National Screening Programme for diabetic retinopathy 2003-2016. Acta Diabetol 2017;54:515-25. Scanlon PH, Aldington SJ, Stratton IM. Short report: Complications delay in diabetic retinopathy screening increases the rate of detection of referable diabetic retinopathy. DiabetMed 2014;31:439-42. Raczynska D, Zorena K, Urban B, Zalewski D, Skorek A, Malukiewicz G, et al. Current trends in the monitoring and treatment of diabetic retinopathy in young adults. Mediators Inflamm 2014;2014:492926. Looker HC, Nyangoma SO, Cromie D, Olson JA, Leese GP, Black M, et al. Diabetic retinopathy at diagnosis of type 2 diabetes in Scotland. Diabetologia 2012;55:2335-42.